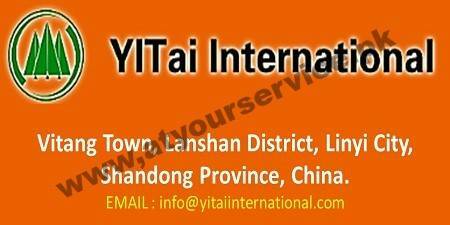 YITai International is located in Vitang Town, Lanshan, Linyi, Shanding, China. LINYI YITAI INTERNATIONAL TRADING CO.,LTD was founded in 1995.The factory is located in YITANG TOWN,LANSHAN DISTRICT,LINYI CITY,SHANDONG PROVINCE. One of the most famous plywood manufacturers. We strictly adhere to the business philosophy of honesty and transparency. The recognition and trust of our customers are the foundation for the growth and success of our organization during the past two decades since the inspection in the year 1995. We can produce 100,000 Cubic Meter per year. We welcome the customers from various countries and regions to visit our factory to discuss cooperation.